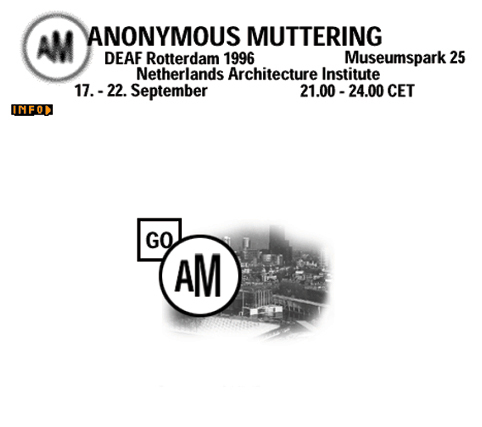 „AM anonymous muttering“ 1996 – 1997 public sphere urban Interfaces Web interface interventions in urban and electronic sounds analog and digital interfaces live-webcast In the project Anonymous Muttering, Knowbotic Research organises unpredictable light and sound events which can be experienced in specially develeloped outdoor location at outdoor locations as well as via this website. The sounds produced by DJ’s at several clubs are taken live and are transformed by a computer set-up into fragments of digital information. This digital material can then be worked on, manipulated and recombined. By bending and folding the graphic interface on the website the sounds are transformed into new shapes. This can be heard live with a RealAudio player, a sort of direct broadcasting via the Internet. 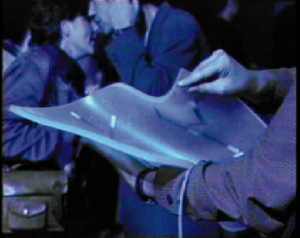 Visitors at the outdoor locations can fold a special a silicon membrane. The effects of this intervention can be heard in a 3D sound environment. 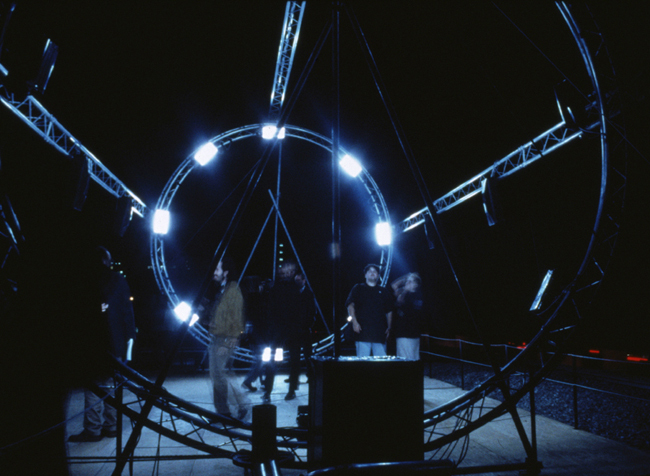 They also trigger the lights in two vertical circles of stroboscopes and thus wrap the visitor in a dense feltof lights and sounds. 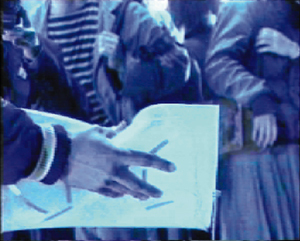 Thus it is impossible to decide who produces which effects: the visitors in the urban space, the visitors on the Net and the computer set-up operate together and produce an anonymous and unpredictable output.